Owners will face mounting difficulties in getting BWT retrofits completed in time for the 2025 regulatory deadline unless they take fast action to complete planning, and place orders for both their chosen system and the yard slots to fit them. Already, with about 250 yards around the world expecting to retrofit up to 50,000 ships – 40 per year per yard- the are obvious potential bottlenecks. But manufacturers too are having to scale up massively now that orders are starting to take off. France’s Bio-Sea have seen sales growth in the first month of 2019 already exceed their 2018 total. 20% of the orders are for new builds, with 80% going to the retrofit market. They expect demand to peak in 2021/22, then to peak again in 2024 just before the deadline. Their estimations of total cost to the world’s fleet is lower than others had previously predicted, and realistically they suggest an average across all ships of about 600,000 Euro, of which about half will be the cost of BWT units and about half the cost of planning, surveys and installations. The UV market will be worth about 7.5 bn Euros for retrofit equipment, and about the same for installation. UV will account for more than 50% of the market in number of systems and total flow rates. 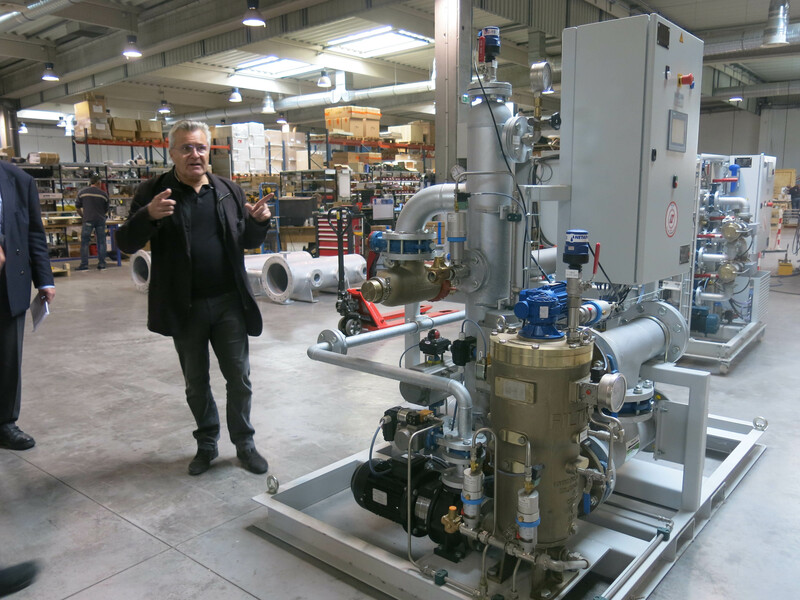 BIO-Sea, who currently have units installed on 134 vessels, briefed journalists on industry-wide challenges to meeting the fast-growing increase in demand. Even for systems that have already received IMO and USCG approvals, lead-times may start to stretch as suppliers of components such as filtration units face a knock-on surge in orders: filter manufacturers are already asking for forecasts for 2020. Benoit Gillmann, Bio-UV Group President and CEO, says that UV treatment systems will account for about half of the total BWT market: electrochlorination systems will be the usual choice for ships needing very high flow rates, but vessels such as containers, smaller bulkers, Navy ships , ROROs, ferries and cruise ships where flow rates not so high will find UV the better alternative. BIOSEA’s systems can handle up to 2000 m2/hr flow rates with one unit. USCG approvals now take about 3 months, and holding times required by the Coast Guard for non-approved systems are a significant factor in sales. BIOSEA recently won orders in Canada because they are now able to offer no holding time from the Coast Guard. Gillmann says the market for retrofit is via owners, who tell the yard what equipment to fit. BIOSEA is now experimenting with financial/leasing options, such as BNP Paribas already doing with scrubbers. But, as with scrubber manufacturers who are already fully booked a year ahead, a similar crunch is coming for BWT manufacturers. The time to build a skip unit is about 4 months (or 2 months for a small unit such as for a superyacht). While production is done in BIOSEA’s Southern France facility, they are now arranging for assembly in China. Gillmann explains that UV treatments BIO UV uses 22kw lamps containing argon gas with mercury vapour. The UV achieves disinfection, not filtration, and is the fastest growing method of treatment. The UV dose – the critical measure of the system – is affected by flow rate, the UV output of the lamp and, crucially, UV Transmission within the water. This makes affective filtration very important, as UV transmission rates drop off very quickly as the water becomes dirtier. In areas such as Shanghai the water can be visibly very murky indeed, but even water that appears clean can be a problem. BIOSEA’s units monitor all these factors and adjust the UV output and, where necessary, the flow rate to achieve a correct UV dose. Once units have type approval the design is fixed, so their machines are designed with high levels of tolerance. Rather than making a large range of units, BIOSEA use the approach of adding more units to cope with higher flow rates. In the future, says Gillmann, LED UV tubes will replace the current gas tubes, but these don’t yet have enough power and currently can handle only very low flow rates. Gillmann says they may be ready in about 5 years.